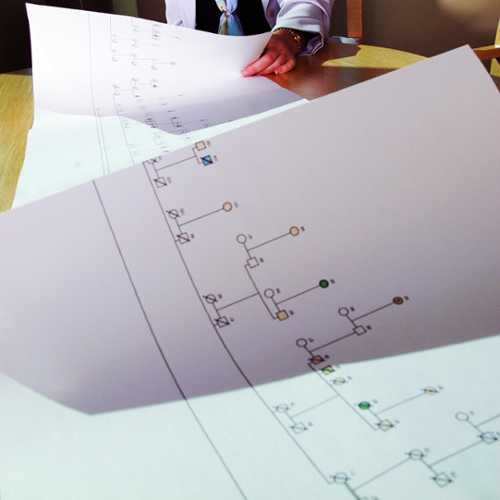 Researchers used genealogy information from the Utah Population Database. A study recently published in the Journal of Thoracic Oncology supports the theory that lung cancer patients who have never smoked may have a genetic susceptibility to develop lung cancer. The study also shows that the type of cancer these patients have is very different from the cancer of those who smoked. The study focused on non–small cell lung cancer patients who had never smoked and lived in Utah. Wallace Akerley, MD, director of the Lung Cancer Disease Center at Huntsman Cancer Institute (HCI) and a professor of internal medicine at the University of Utah (U of U), and Lisa Cannon-Albright, PhD, a genetic epidemiologist at HCI and a professor of internal medicine at the U of U, worked on the study with Shamus R. Carr, MD, an assistant professor of surgery at the University of Maryland. The researchers used genealogy information from the Utah Population Database and the Utah Cancer Registry, along with statistics collected from Utah death certificates. The breadth of information collected from these sources and used for this study trace back to the mid-1800s. “This type of research could only have been done in Utah due to its genetic resources,” said Akerley. Utah is recognized for having the lowest smoking rate in the nation. Despite the low smoking rate, lung cancer still occurs in those who don’t smoke, and lung cancer remains the leading cause of cancer death in Utah. In addition, lung cancer in smokers and people who have never smoked behave differently, so the researchers wanted to know why. “This study is significant because it supports our hypothesis that lung cancer in people who’ve never smoked is unique and distinct from the common smoking-related cancer,” according to Akerley. He went on to say that recognizing that lung cancer in people who’ve never smoked as unique, is a major and essential step to studying the causes of cancer. The researchers think this information may be useful in discussions with patients and family members, as it relates to cause and environmental factors. It may also help in focusing future research on genes associated with predisposition to lung cancer. The work was supported by the National Institutes of Health/National Cancer Institute P30 CA24014, and the Huntsman Cancer Foundation.